Numbers have names, names have stories… and every stories matters to God. Check out our 2017 Impact Report to see some of the ways that God has been at work in and through the LifePoint family. As spring approaches, the pace for our building project is picking up speed (check out this overview for a bit of background)! This is such an exciting – and demanding – season for our church family. We’re currently waste-deep in three phases of the project: design, build, and banking. Last week our architect, Dave Wilde, came for a visit to walk a team of elders, staff, and volunteers through the latest rendition of our building plans. This was an opportunity for discussion and final tweaks before we hit the point where edits and updates won’t be so easy (or cheap!). Dave Wilde walks the team through updated drawings. Dave will be back in Quincy again next week for more discussion. I’m so thankful for this team’s willingness to get into the weeds of the building design. They are intentionally and carefully thinking through details like lobby flow, room acoustics, and door handles – and they are doing so ever sensitive to our mission and purpose as a church. This group gets it: the church is not a building… but they are working hard to make it as an effective a tool as possible for the ministry that God has given us! Keep this team in your prayers! Tim Koontz leading a discussion on design details in the new building. While the Building Vision Team works on the final 2% of design details, we have been able to secure an on-budget bid from Maas Construction based on Dave’s design. We don’t have anything signed yet (that’s dependent on the third phase, banking)… but this is very exciting! If all goes well, Maas would look to break ground in early March (weather permitting)! Please, pray for the wisdom and discernment of our elders as we prayerfully consider this bid – and work out the necessary details to make it happen. By no means is a building a finish line for us… but an exciting landmark along the way! Speaking of necessary details, we can’t sign a contract with a builder until we’ve talked to the banks. With $1.3 million in hand, we’re in an incredibly blessed position as we talk to banks about helping to finance the remainder of the project. While we’ve had ongoing conversations with banks this fall, now that we have building plans and a firm bid, we can have more concrete conversations about numbers and terms. We have several meetings scheduled for this week and next! Once again, our elders are desperate for your prayer! As the spring nears, the building project is coming together fast! The next 2-3 weeks will be full of important meetings and decisions. LifePoint, please join us in prayer over every aspect and each phase of this project. It is God’s – and we want to seek Him and His leading each step of the way! So thankful to be on this adventure with YOU – and so thankful for your prayers, generosity, and support!! Tonight, in the Geissler home, we had an incredibly precious moment as a family. We were blessed to have one of LifePoint’s international aid workers, Liz, over for a visit. As we were getting our daughter Claire ready for bed, she asked me about a song she remembered from church, “What a Beautiful Name it is.” This floored me! Claire insisted that before she went to bed, we go back in to see her mom and Liz, and all sing that song together. So, there in our living, at nearly eight o’clock at night, our two year old daughter led all of us grown-ups in worship. If that weren’t incredibly moving and precious enough, as I’m placing my daughter in her bed, Claire tells me, with no prompting and with complete confidence, that Jesus loves her a lot. LifePoint, in the short time that we have existed as a local church, we have witnessed so many lives that have been radically transformed by the power of the gospel. People who were at one time so distant and perhaps hostile to God, have had their lives turned upside down and now can’t be kept from talking about their Saving King, Jesus! I look around on Sunday morning, and I see so many people who have abandoned the notion of just wanting to maintain a comfortable, no-risk relationship with God – people who are venturing out into the deep, trusting that their Lord is with them as they go and risk for Him and for the sake of others. As we prepare for this new building, we have to ask ourselves this question, “what’s your final destination in all of this?” If you’re one that feels we’ve “arrived,” and have reached the finish line once we’ve had our first service in this new building, then I’m sorry to say you’ve missed it. You have missed out on the greatest adventure that can ever be found in all of human existence! And that adventure has been going on for quite some time now. Do you long for others to have that joy that you have in knowing and partnering with Jesus? If you do, then join us in this work! Let’s partner together to see our city transformed by the power of the gospel! All that you may find wrong and broken about this city can be restored and made new, but nothing that you or I possess apart from Christ will do anything to truly redeem it. Only Christ can! I’m excited for this new building! Countless others are excited about this new building! But, are we ready for what we are supposed to do with it? That preparation begins right now. Are you allowing Jesus to rebuild and restore your life? As important and significant as it is (and I DO NOT say this lightly), the building is the easy part. (1) Miss a week? Catch-up here. >The crew at “The Bible Project” does a great job with book overviews. 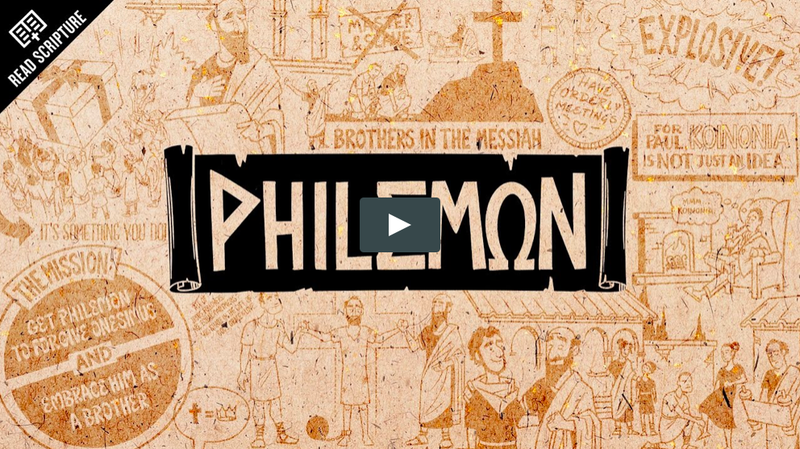 Here’s a snapshot of Philemon’s structure and themes! >Want to learn to study the Bible? I’ll be teaching a 12-session class called “Biblical Interpretation for Ministry.” It will be intense, but “fun” (*definitions of fun may vary). Check out the syllabus here. We’ll meet Thursdays from 6-7am beginning on 2/15. If you’re interested, email me (bsanner@lifepointqcy.org) for more info! You Can Change: God’s Transforming Power for our Sinful Behavior and Negative Emotions, by Tim Chester (Christian Living) *Ready for change? Chester offers a practical approach to experiencing real change through the power of the gospel. Dream with Me: Race, Love, and the Struggle We Must Win, by John Perkins (Christian Living) *The racial divisions of our society have no place in the church. Perkins reminds us that the gospel call to reconciliation means facing these issues head-on! Going to Church in the First Century, by Robert Banks (Historical Fiction) *Want to know what a first century house church was like? PhD level historical research shapes this fictionalized account. The Letter to Philemon, by Scot McKnight (Commentary) *McKnight’s verse-by-verse exploration of Philemon is filled with textual and contextual insight; a technical but accessible volume. >We can never be all that God wants us to be on our own. If you’re not in a LifeGroup, contact Kourtney (kprice@lifepointqcy.org) to get plugged-in. >We aren’t just saved from something; we’ve saved for something. The church has a mission. A great starting place for you might be to serve with our missions partners at Horizons. Join a team of LifePoint volunteers on the first Thursday of each month. Contact Danny for more details (dmcmanus@lifepointqcy.org). >Because of Jesus, we go first with a love and forgiveness that defies category! Holding on to a grudge? Is God calling you to forgive someone? Call/text/email that someone today and set a date to connect. You can’t stay bitter and get better. LifePoint, I love being part of such a Gospel-centered, Scripture-saturated, mission-living community! Onward, ever at the heels of Jesus!